Drew counterpoints the piece with a discussion about the Grant Park Music Festival, which is an outstanding–and more importantly, FREE–summer series of concerts that is incredibly well attended. Since some of the barriers to classical music is as much the high ticket prices as well as some of the stuffy formality many associate with it, it is encouraging to find something like this working and drawing in large audiences. The San Francisco Bay Area is a Metropolitan region encompassing San Francisco, Oakland, and San Jose as well as a number of surrounding cities and ‘burbs. With a population approaching 8 million, it is also home to one of the largest concentrations of Chinese Americans in the US at a little over half a million according to the 2010 census. What I’ve discovered is that the Bay Area is also home to probably the greatest concentration of Chinese Orchestras in the US. 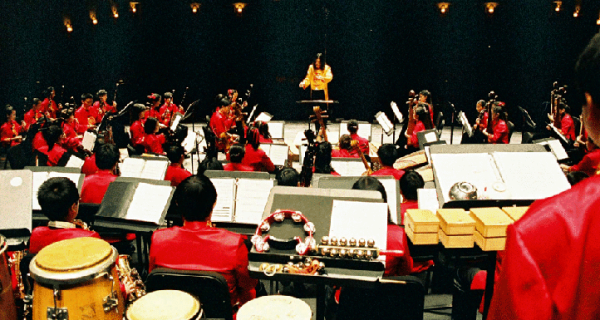 As I’ve been compiling a database of ethnic orchestras in North America (though concentrating, in particular, on the United States) I’ve since discovered just a little over two dozen ensembles in the Bay Area alone. It seems that California in general has the highest concentration of Chinese Orchestras of all the States (cf. the geographic region between Chicago and Detroit which seems to have the highest concentration of Arabic and Middle Eastern ensembles and Orchestras in the US). What’s particularly striking about the Bay Area’s ensembles is the number of Youth Orchestras, and, in a particular case, a k-5th grade Chinese Orchestra. The other striking thing about these (and other ethnic ensembles throughout the US) is the number (roughly half) that have formed since the internet revolution (early to mid 90s), and the number that have formed within the past ten years or so (nearly a third of the total number). I’ve yet to do a rigorous statistical analysis of the numbers as I’m still just compiling the database and doing the tedious task of getting numbers (year formed, number of musicians in the ensembles, etc.) so the preceeding paragraph is just a very rough sketch, but if the trends I had been seeing in the Middle Eastern ensembles is any indication of what’s happening with the Chinese ensembles, there is definitely growth in the number of groups formed and the rate is accelerating somewhat. Granted, there might be some bias in the number of groups as obviously those groups that are no longer active are less likely to show up in simple internet searches. For all we know there could have been many more Chinese Orchestras in the years or decades before the internet. Indeed, there seemed to be a high number of Chinese Opera troupes operating in the states during the last half of the 19th century to first half of the 20th century (see Rodecape, 1944 and Mina Yang, 2001). The situation was similar in New York Chinatown during the period of the National Origins Act when there were up to five separate Chinese Opera Houses in operation (Rao, 2000; 2002). A few weeks ago I finally had the opportunity to watch Greg Cahill’s docufilm about Cambodian vocalist, Ros Sereysothea, The Golden Voice. I was only mildly disappointed. Not for the quality of the film–it is beautifully done–but because there wasn’t enough focus on, well, the music (probably also the biggest issue I had with Olivier Dahan’s docu-film about French Chanteuse, Édith Piaf , La Vie en Rose). I suppose I’m just a sucker for really “dry” (I quote it because to me they aren’t really that “dry”–hah!) and serious “documentaries” about music or musical genres. Something along the lines of, say, Nasser Taghvai’s documentary Dress Rehearsal: The Brave Hurr’s Ta’Zieh, a Ta’Zieh (Persian Passion Play/Opera), ; or Derek Bailey and Siân Busby’s documentary of the Lincoln Center’s production of The Peony Pavilion (Mǔdāntíng), a Kunju (Chinese Opera) piece. It’s not that I didn’t enjoy the dramatized biographies–or that I actually enjoy the genre docs more. I do believe the former are much easier to watch, and likely more pleasurable. But there’s something intellectually satisfying, from a musician’s standpoint, about the latter. See, while the bio-docs focused on things that we all have in common with each other–at the expense of erasing the differences, the genre-docs focused on highly developed Art music (Art theatre, maybe?) hat are so foreign to Western Opera/Musical that it takes no effort to accentuate the differences. I understand that this is a very unfair comparison on many different levels, but I’m just trying to make some sense about what are the things about particular documentary[-like] films that work for me using a few examples I can think of off the cuff. I’ll definitely be coming back to this as I get more in depth with the documentaries that I have in various stages of [in]completion.